Fair warning... that 440/420 F13 car is an exception to the rule, no question about it. I've never seen a cam-only car put down numbers like that, especially considering it's a "small" 230/232... reminiscent of H/C numbers. locked 422.97/409.67,next will get more gear! 2001 LS1, LT's,no cats,3" true duals, lid, smooth bellows, TR55 spark plugs, PY3600E converter. Cam is a Comp turbo grind. 230/226 @ .050. .591/.569 on a 114. Full weight Trans Am with 3.42 gears. Cam is a little big for everyday driving for some people. After tuning it acts fairly mild though. Slight lope at 800rpm. Pulls hard to 6500rpm. just a question what is the point of running more duration on the intake then on the exhaust i have a comp cam 228 224 with .591 .575 on a 112+4 i was wondering if that is a fairly good cam before i install it. I'll go ahead and TTT this. 98 ta, A4 stock converter, 3.42's stock ls1 intake, pacesetter lt's, carsound cats, loudmouth, comp 918 springs,tr224/224 .563/.563 112 lsa, tuned by HPE. Drives great, stalls very rarely only because I need a bigger stall. That's the cam that I was thinking about, but that dyno, in my opinion, seems kind of low, even for a A4. Driveability: Not as bad as you would think for such a big cam, it's more of a question of how well can you drive it? Most drivers would be able to handle it without a problem, but as far as someone who wants a cam for a daily driver i would have to reccomend that you choose something smaller like 224/224 duration with a smaller lift which wouldnt be so noticable. Reason being is that the cam is rather aggressive and lopey and traffic situations get annoying quick, as far as the highway, the cam is just as smooth as any other.. Below is a graph of my dyno, up top i have some sort of mechanical malfuntion which is why it doesn't continue all the way to 7000 pulling, but hopefully i can fix it and get some more ponies..
Is that dyno with a wet shot? Noticed the 150 only gained 7hp and lost 20tq??? I just put in a 226/226 585/585 112 XER and was planning to spray it lol wondering what I might expect with my mods? Last edited by stone4779; 03-14-2005 at 01:15 AM. What are the specs on that cam? I put 354 RWHP and 338 RWTQ on APE's Mustang dyno with just a lid, 85mm MAF, and SLP headers with the ORP. This was in a 99 Z28 M6. 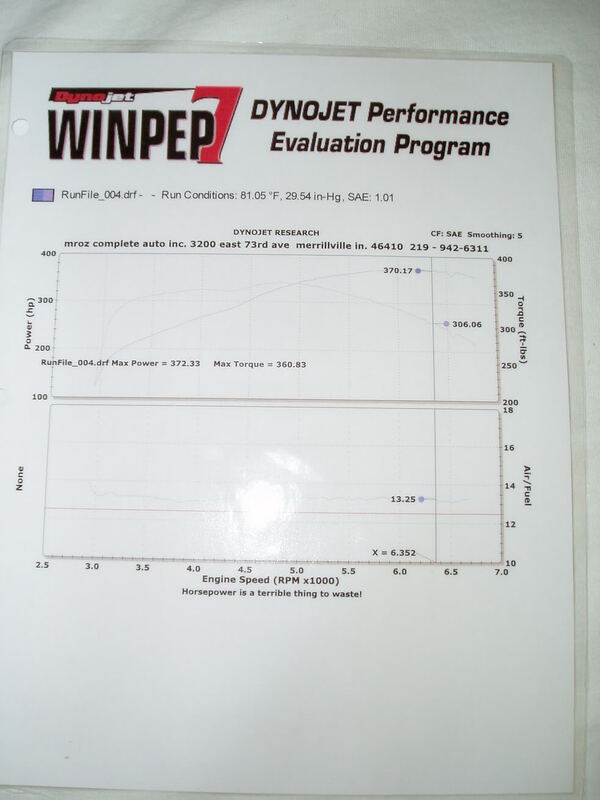 I would like to see what my numbers are with my cutout and ls6 intake added on a dynojet. It was very streetable with the 3.42 diff and it is great with the 4.10 diff. .......and it is great with the 4.10 diff.